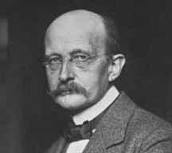 The German physicist Max Karl Ernst Ludwig Planck (1858-1947) discovered the quantum of action which provided the key concept for the development of quantum theory. Max Planck was born on April 23, 1858, in Kiel. The son of a distinguished jurist and professor of law, he inherited and sustained the family tradition of idealism, trustworthiness, conservatism, and devotion to church and state. Planck studied at the University of Munich (1875-1877) and the University of Berlin (1877-1878). At Berlin he took courses from Hermann von Helmholz and Gustav Kirchhoff. Returning to Munich, Planck completed his thesis for his doctorate in 1879. It was on the second law of thermodynamics, Planck's favorite theme throughout his long and productive life. However, his keen insight into the second law of thermodynamics gained him no professional recognition whatsoever. Displaying his characteristically indomitable will, Planck refused to become discouraged and to allow his researches to be interrupted. In 1880 Planck completed his Habilitationsschrift, which enabled him to become a privatdozent (lecturer) at the University of Munich. In that tenuous position he waited in vain for years to receive an offer of a professorship, longing to be independent professionally, as well as from his parents, with whom he was still living. He submitted a paper, "The Nature of Energy," in 1885 for a prize to be awarded by the University of Göttingen in 1887. He received the second prize (the first prize was not awarded), and in 1889, after the death of Kirchhoff, he became associate professor at Berlin. Three years later he was promoted to full professor. He remained in Berlin for the rest of his life. Planck's early years at Berlin were also the years during which his scientific horizons expanded enormously. There was at the time great interest in physical chemistry, and he contributed to this field, first, by introducing key concepts such as thermodynamic potentials, and, second, by applying these concepts to specific problems. Many of his early researches are in his famous Lectures on Thermodynamics (1897), in which he also introduced many of our modern definitions, symbols, and examples. In 1897 Planck returned to the second law of thermodynamics. What attracted his attention were the experiments being carried out at the National Physical Laboratory in Berlin-Charlottenburg on so-called blackbody radiation, the radiation emitted by a "perfect emitter," that is, a body that reemits all of the radiation incident on it. Of particular interest was the spectral energy distribution--the amount of energy emitted at each radiant frequency--of blackbody radiation. Planck sought to relate this radiation to the second law of thermodynamics. In 1900 he obtained a new radiation formula by interpolation between two experimentally determined spectral limits, the high-frequency limit consistent with Wien's law and the low-frequency limit consistent with the data of Planck's colleagues Rubens and Kulbaum. Planck's law had been discovered. Planck's law was no more than a "lucky intuition," as Planck called it. This was terribly unsatisfactory, and therefore he immediately began "the task of investing it with a true physical meaning." "After a few weeks of the most strenuous work of my life," he recalled,"the darkness lifted and an unexpected vista began to appear." Two crucial insights were involved. The first involved a profound break in Planck's conception of the second law of thermodynamics. In all of his earlier researches, he had regarded the second law as "absolute" as the first--both were laws that admitted of no exceptions. Now he found himself driven inexorably to the conviction that Ludwig Boltzmann, not he, had been correct in arguing that the second law is an irreducibly statistical law: the entropy is directly related to the probability that a given microscopic (atomic) state will occur. Planck's second insight involved a sharp break with all earlier physical theory. He found that to theoretically derive his interpolated blackbody radiation law, it was necessary to assume, contrary to all earlier assumptions, that the energy stored in the blackbody oscillators is not indefinitely divisible but is actually built up out of an infinite number of "bits," or quanta of energy. He concluded that the energy of each quantum is a multiple of the quantum energy hf, where f is the frequency of the oscillator and h is now universally known as "Planck's constant" or "Planck's quantum of action." When Planck in 1900 made the discovery that immortalized his name and won for him the Nobel Prize in 1919 and numerous other honors, he was 42 years old. In subsequent years he continued to work at a steady pace and contribute to topics of current interest. In addition to the work already discussed, he studied the statistical aspects of white light, dispersion, and the optical properties of metals; probed various topics in statistical mechanics and kinetic theory; and applied quantum theory to systems of many degrees of freedom, to molecular rotational spectra, and to chemical bonding. Planck was one of the first to champion Albert Einstein's 1905 special theory of relativity. Planck's deep interest in relativity, and his general admiration and appreciation of Einstein's revolutionary insights, made it natural that he should try to persuade Einstein to join the Berlin faculty. He succeeded in bringing Einstein to Berlin in 1914. As permanent secretary (1912-1938) of the mathematics-physics section of the Prussian Academy of Science and as president (1920-1937) of the Kaiser Wilhelm Gesellschaft (now called the Max Planck Gesellschaft), Planck saw many of his esteemed Jewish colleagues, including Einstein, persecuted. As James Franck, who resigned his Göttingen professorship in protest against Hitler's policies, recalled, "Planck hated Hitler's laws, but they were the Law and therefore must be obeyed as long as they were in force." Planck at one point tried personally to convince Hitler of the damage he was doing German science, but his words had no effect. Planck's Berlin villa was destroyed by bombs. His son Erwin was involved in the July 1944 attempt on Hitler's life and in 1945 died at the hands of the Gestapo. Planck died in Göttingen on Oct. 4, 1947.